I play, teach, and adore the tuba. The fact that I am a female has weaved in and out of my tuba-playing status since I began my study of the instrument at age nine. While gender is an easy category to sort your beginning instrumental classes into, I believe it is an unnecessary one. Any student can play any instrument, regardless of their gender identity. Gender should cease to be a factor in instrument choice. Let the people play what they feel the most in tune within their souls! To show you that gender-biased instrument selection is real, and to help you combat it in your own life, I will take you through my personal experience, the experience of my students, and finally, ways that you can discuss this topic with parents and students in your own programs. It did not occur to me that playing the tuba was not considered a common instrument for a girl until others made comments upon my choice. “Oh, I bet you’ll have fun sitting with all the boys!” “Aren’t you too small to play that?” “Don’t you wish you played the piccolo?” A firm “No” resounded in my head every time I was asked any of these queries, but I politely smiled and answered sheepishly instead. The truth was, I chose the tuba because I adore bass lines. I love being the foundation of an ensemble, and I love listening to the melodies soar above me. But there is a gender bias, suggesting that men play brass and women play instruments like the flute and the violin. I have never agreed with that. And part of me wonders why we have to act surprised when we see any female brass player. I heard growing up – from my fellow women brass musicians – that it was viewed as “undainty to buzz.” But it is 2019. I think we can move on with the fact that any gendered person can accomplish anything they put their mind to, no matter how it makes them look. And where does this judgment come from? Why does it need to exist? The answer is simple: it does not need to. Listen for any language that limits students’ instrument choice and kindly challenge it. I wrapped my identity around being a “Tuba Girl” early on because of the hoopla people put in my head around my gender being tied comically to my instrument. I am proud of both my instrument and my gender, but it ultimately does not affect my musicianship. Both men and women have to work equally hard to achieve the highest performance levels. Try the new SmartMusic for free! In my middle school, the flute section in every grade has both boys and girls. The 6th- and 8th-grade trumpets are well divided by gender. There are plenty of boy and girl violinists. Where the balance is skewed is indeed in the low brass section. While I did not recruit these students, I look forward to recruitment in the future, and I am committed to keeping gender completely out of it. Let students find the sound that they are attracted to! That is the best recruiting and retention technique. What do they enjoy listening to, and what makes their heart sing when they make a sound on it? That is going to be the instrument for them! 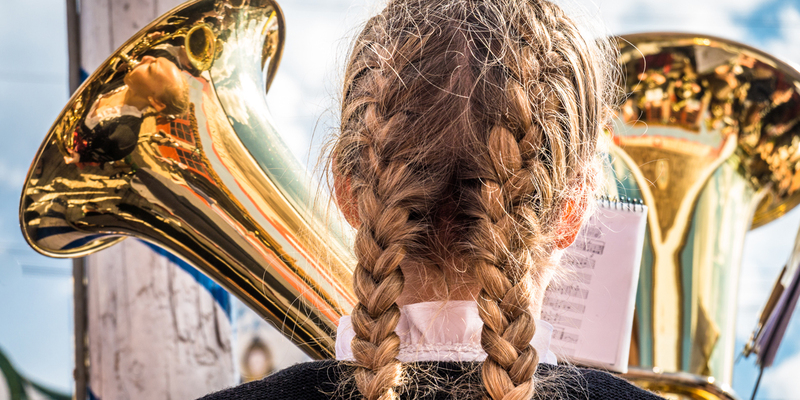 There is no reason to say to a young lady who plays a beautiful sound on a trombone, “Well that was fantastic for a girl!” No, that was fantastic, period. If she loves the way the trombone feels and sounds, let her go for it! The same goes for any young man on any instrument he desires. If parents fight back with a gender-biased statement, I have found that it is best to approach them calmly and with the same sentiments that I mentioned above. Does your child love how they sound on this instrument? Then it is a fit for them! Tell them that instruments do not have gender. They think that only young ladies play the flute? The French flute school of playing was started by men. Paul Taffanel, Marcel Moyse, more recently James Galway…the list goes on! You can show parents and students examples of fantastic musicians of any gender so that way they see that gender is certainly not a limiting factor. I think when we give instruments a gender, we close our minds to the greatest accomplishments that our students could potentially achieve! Be open and willing to let your students try new things. Give them every opportunity you can, and encouragement along the way. Happy playing! Heather Ewer grew up in Arvada, CO and has been happily playing the tuba since the 4th grade. She graduated with a degree in music education from Western Michigan University. Now in her second year teaching band with Mapleton Public Schools, Ms. Ewer enjoys sharing her passion for music with 5th and 6th grade students. After school, Ms. Ewer works with students in the Colorado Honor Band Association and plays her tuba in a variety of community groups-including the Jefferson County Community Band, the Golden Eagle Concert Band, and the Aurora Symphony. In addition to playing tuba, she loves to hike, ride her bike, watch musical theatre, and curl.